Project Playroom is completely underway and we are loving the transformation! One of the ways we have been creating this super kid friendly space, is through oodles of IKEA furniture and storage pieces. However, it has really been my goal to bring in more old to mix with the new. And not just in the playroom, but all over the home. So, I found a great shop on Etsy, Lemons 'n' Limes, and began working with the shop owner, Lindy, to find some perfectly pretty upcycled photo frames for our home. I am hooked! I love the character and whimsy and feeling of "home" they bring to the space. Just incredible! Do you want to know what is even better than this super awesome playroom update? 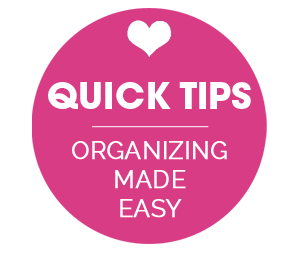 Lindy has been an IHeart Organizing reader for awhile now, and she offered to host this week's giveaway! Two of you lucky friends will have the opportunity to score a $50 credit to the Lemons 'n' Limes Etsy Shop where you could find some lovely upcycled frames or other fabulous items! Also, Lindy loves custom orders! If you see a style, size, color, shape of frame you want but it is not listed please ask. Most all purchases will be considered a "custom" order. Custom orders will take 4-6 weeks for completion. I love the upcycled vintage frames! love the frames you got...I would pick the same thing for sure. love the frames!! I would love to win! These are awesome! Thank you for the chance!! If I win, I would choose some custom vintage frames! I love the butter yellow upcycled canister set! so cute! Lovely giveaway! I love the frames you've added to the play room! I love the vintage look frames and am also trying to make my home a bit more "eclectic". I'd choose either the frames or an old suitcase. And, yay, the comp is open to everyone. I love both the spice racks and all the frames. What an awesome giveaway. I'd choose frames for sure.... although the spice racks are pretty cute, too! Beautiful frames! What a great giveaway! 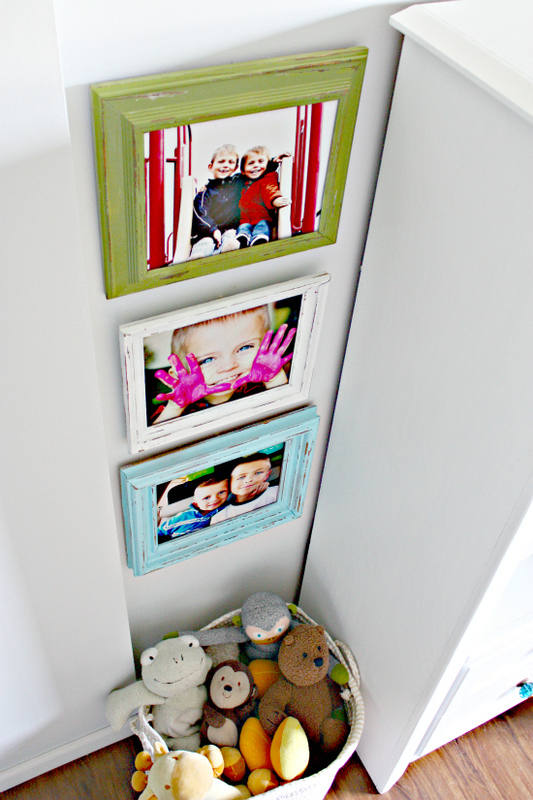 love the frames...could use them to frame a small chalkboard, mirror, or make a jewelry organizer...cute! Those frames are so beautiful... I'm off to do some browsing now! I love these frames, they add such charm to the room! I love the distressed frames! Perfect for our playroom! Well, I left a comment and Rafflecopter won't let me back in. Just FYI. I like the vintage rocker. My daughter would love to rock in that. Love the frames! I need a pop of color in my house. Love those frames! I'd choose those or the spice rack-vinegar/oil holder! My walls are brown my couch is brown....too much browns need COLOR!!!!! Has to be the rocking chair - so cute! I love the frames! I am currently in the middle of changing up my photo wall in my living-room...the distressed frames would be a awesome addition! Thank you for the chance! The frames are my favorites! I love the colors and how they are so sweet together. I LOVE the colorful frames! I love the frames! I especially love that she does custom orders; I have some oddly-sized photos I've been searching for frames for. I would probably grab this listing "CHOOSE YOUR COLOR 8x10 Pale Pink Vintage Upcycled Painted Frame". Thanks for the chance! I love these! I am helping my sister decorate/organize her new nursery and the YELLOW frame would be the perfect accent to her gray walls! I'd get the avocado green vintage frame! The rocker. There's only one! I love the rocker and the frames. Anything from Lemons n Limes would look lovely in my very vintage house. 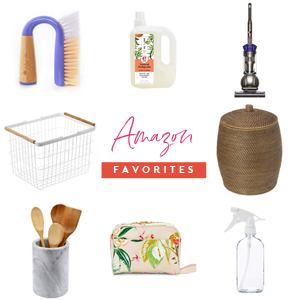 I am always looking for something that would bring a unique quality. Those frames look fabulous in your space! I love the pictures inside too! So much fun! I totally love the frames! Love the colors . . . and all of them would go great in my house! What a wonderful idea! 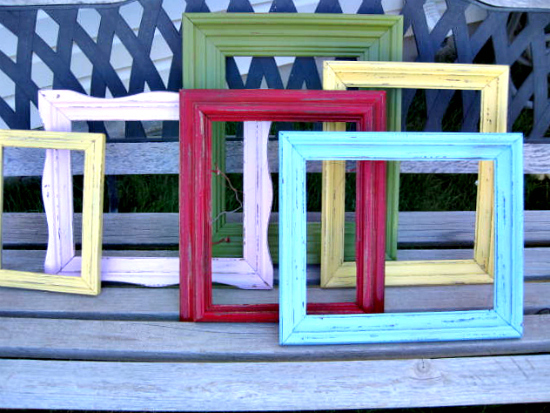 I would get some of the vintage upcycled frames as well, co cute and I love that you can pick the colors if you want! I LOVE love the avacado and aqua frame colors! I would get the wavy edged frame and a couple of straight edged ones to give my house some color! So fun! I love the white spice racks, and with all of my spices, I would probably need 2 of them. Beautiful! I would love some of those frames in my house! The frames are so cute! I would love some! I love the upcycled vintage frames. I would definitely choose them! I love the frames too! Blue and Green for me:)! Love these frames! We just had our very first pictures done as a family of three so I am in search for frames! This would be a great win! Great frames, traditional with a vintage mix. The frames - I've been wanting to do a project like that. I would love the gold shabby chic vintage frame...painted or left the gorgeous gold, distressed color. I just love the frames! The frames just like you have! I love the aqua frame! l & l's upcycled frames are very nice. They would make a nice gift! I would love the distressed white frames for my bathroom. I would get the distressed frames for my son's playroom/bedroom! Love the colors of the frames all together! Would be perfect in our new home! 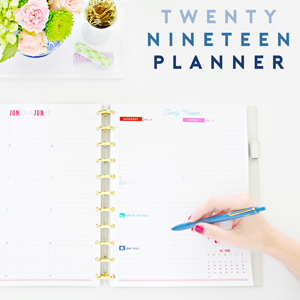 I love the idea of mixing old and new, as well as reusing old stuff instead of just having it tossed in the trash. I like the dark red and sage green frames together. Love these! They look great and work in the room perfectly! I'd go with a mix of colored frames for my hallway. I would love a set of the colorful frames! I love, love, love the Upcycled Vintage Frames. I would get a green one and blue one for my son's bedroom. I like the color of the frames, bright & cheery! Those are very cute! Thanks for the giveaway! You can earn 5 more entries today! Finish these 0 entries to unlock the rest. I would choose the frames. They look great. I also liked the vintage canister set. Thanks for the chance. These frames would look perfect in our new house!!! love the look of them! I love those bright pink hands. Total personality! I would get some frames. those frames are pretty cute! I would definitely get lots of frames for my bare walls!! They are so cute! Love the frames - great colors! Likely the adorable frames, but that little rocking chair is great too! I love the Butter Yellow Distressed Vintage Shabby Chic Upcycled Canister Set. Perfect for my craft room! I would choose frames. I love the ones on your wall. I would definitely get frames! I've been trying to redo my gallery wall for months but can't find exactly what I want! And she's got them! Love the frames! They are perfectly gorgeous! I would for sure get the frames in blue colors to go with our family room and kitchen decor. Love them! I love the frames. 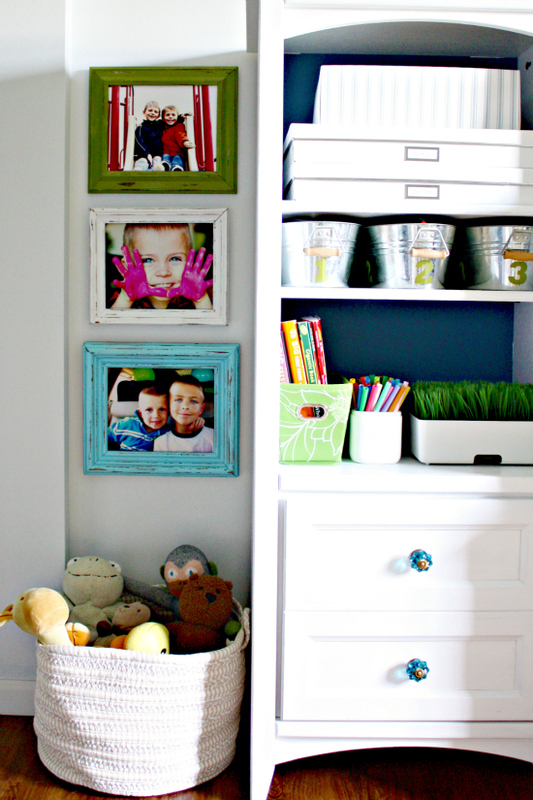 I would love to use them to hang some of my daughter's pictures in the stairwell! I would absolutely get some frames! I also don't have any vintage in my house, but these frames would be perfect. I need to decide where to place some, though I feel they'd go great anywhere! I LOVE the ribbon lined frames - so cute! Definitely the frames. All my frames are white, and am in need of a change! Love the frames!! Would look great in my son's room or anywhere in our house for that matter! I have 0 distressed items in my house. That needs to change pronto! Love the frames and they match my laundry room that I am redecorating. I love these frames! I would definitely get some custom work with the gift card! I really love all the frames and could put them to good use all over my house. I also love the distressed spice rack and would probably put it in my bathroom to hold pretty containers with cotton balls and other toiletries. 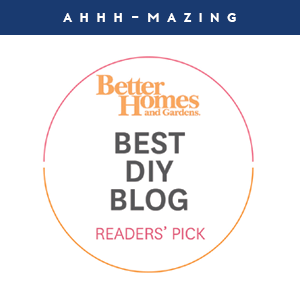 I would pick the upcycled vintage frames! these are such cute frames! And the pictures you put in them are adorable as well! 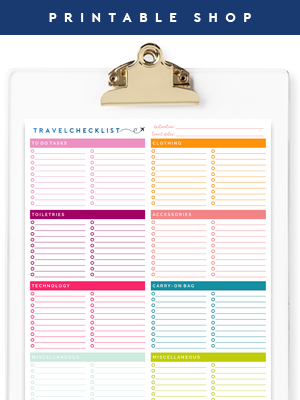 I love the frames on this post as well as the vintage suitcases! Can't wait to find out who wins. What great prices! That $50 would go a long way on custom frames! I also love the shabby spice rack! I'm designing an art gallery wall and these frames would look fab! I would purchase the distressed frames as you have. In teal and green. So cute. I have a question about entering the contests, do we have to complete all 5 options? Nope - each is just an additional entry into the giveaway, but all are not required to win. I love the set of 3 frames. The green and blue are perfect in my house and my little girl would love a purple one in her room!!! The upcycled vintage frame would look AMAZING in my bedroom!! I have to say that I would be buying MANY frames in many colors from her shop. They would look fantastic in our home!!! Those frames are perfection! And your boys are adorable, those colors really pop! I am having trouble...the giveaway tool won't let me use it. I need some of those frames they are great. 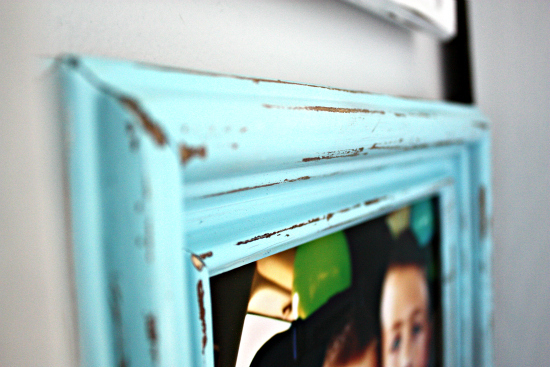 I love the set of three distressed frames! 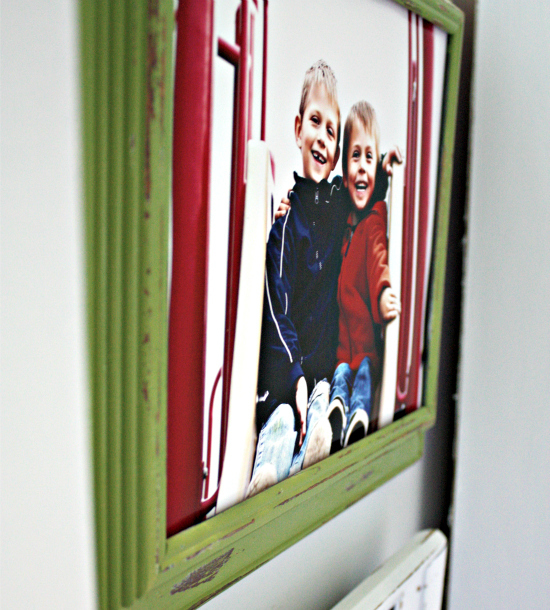 I've got lots of bank walls in our home... And the little punch of color that these frames add would be perfect! Oh, my gosh. Those are precious in there. The photo of your son with the pink painted hands is just so darn precious. This room is magazine worthy. So excited to see the whole thing. I would love the vintage rocker for my little girls room. Those frames (and pictures) are beautiful! I would love a set of 3 distressed frames for our play room!! I love the frames the best. Super cute! Love the pictures! The colors are awesome! Oh, I love the frames. We have a few distressed pieces in our house - I love the look. We also have some things that have become distressed thanks to our four children!!! Super cute frames--luv the distressed look! She does a great job with these!! I would choose Custom Upcycled Vintage Frames 3 8x10 Painted Frames. These are exactly what I am trying to do in my dining room. I hope I win!!! Super cute!! Would love to frame a print I just purchased at an art showing for my friend's babysitter, my very cool friend hosted a gallery night featuring her work, and the profits went to her schooling costs. Emma, the artist, is off to Rhode Island School of Design in the fall. Your frames are fabulous and I would use the hot pink one to frame the pics I just had taken of my daughters. I really like the canister set - it would be so cute and useful in the kitchen! I just bought my first apartment, and I'm so excited to start decorating. Those frames would fit perfectly with the decor for my office! Absolutely love them. working on my dining room now...tons of possibilities for these! Love the way you distressed them! You should do a tutorial on it! What an adorable Etsy shop! Love the bright distressed look! Defnitely would get the frames, just like yours but maybe different colors. Love them! I would absolutely order several photo frames. I am having my dogs' portraits done this summer, and I want a cute way to display the photos! I would buy the frames and the spice rack! So cute! I love the touch of whimsy! I. Need. These. Frames! I am doing a collage wall with beach photos on metal and these would compliment them so well. LOVE! I think these look great in your play room! And I really love the color combination. I'm really digging the upcycled metal candle holders and would put them in my dining room. I absolutely love this idea and plan to get the frames from Lemons n' Limes. I have four children and they kind of all share a room. I have fantastic close up pictures of my kids playing in the mud and playing with giant bubbles! I look forward to blowing these pictures up and putting them in those fantastic frames. Hope I win! I love the look of the vintage distressed frames! and the pictures make it even better!!! I also love how homey it feels when put next to that big amazingly awesome crochet basket! where did you get that from!?! I need to make one! I can't get rafflecopter to work? It says I can enter 5 more times, but it won't let me? The Vintage Rocker is super cute! Would go great in my little boy's room! Cute! Hope I win. I would go with pink and teal! I love the frames in teal & green. The rocking chair is great too but I would pick the frames! Thanks for the giveaway! Would love a new frame! I can't wait! I would love to win the "Great Shabby Chic Spice Rack or Vinegar/Oil Holder for Kitchen" It is absolutely perfect for a space in our entryway!!! I love the vintage metal candle holders! These frames would look great in my living room! I would get the set of 3 8X10's. So cute, love them in your space. I love all the frames. I would do a whole wall of them in my kids' playroom. Love the shabby chic spice rack!! I'm with everyone else. There are so many things I could do with those cute frames! I'd pick the 3 8x10s. I'd have to pick the frames too! I love the distressed look.. I'd definitely pick the frames. I've got a couple (or three) pictures I'd love to update the frames with! The frames would be put to good use in my house! I love the vintage up-cycled frames! I love love love them. I'd love some frames but I also really like the large towncraft suitcase! I love the avocado green frames. I'd love the 3 8x10 distressed frames! I would definitely go for some frames! I am having a garage sale and selling my current ones, so I'm on the lookout and I love that distressed look! I would choose the frames too! I love the white shabby spice rack, it's beautiful! I would select the Vintage Upcyled Set of Hanging Metal Candle Holders. There would definitely be some frames coming to me for my DDs gallery wall! Can anyone ever have too many cute frames! The colors are great!! I would love some of those frames! Such pretty colors! love these frames! too cute! O wow!! Those are gorgeous!! I would def have to get an aqua, green, white and I'm not sure what other color frames:) LOVE!! !